The University of Massachusetts Dartmouth is a premier research institution on the state’s southeastern coast, offering 14 doctoral programs and 33 master’s degree programs on campus and online. Graduate programs exist in all of UMassD’s seven colleges and schools: College of Arts and Science, Charlton College of Business, College of Engineering, College of Nursing, College of Visual and Performing Arts, School for Marine Science and Technology, and UMass Law. 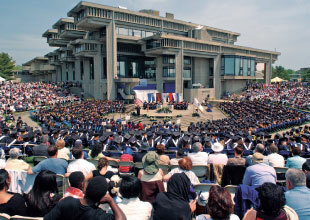 Part of the highly regarded UMass system, UMass Dartmouth draws on the region’s strengths to offer outstanding programs in the marine sciences and biomedical engineering and biotechnology fields and has become an educational and research leader in business, engineering, health care, teaching, and the liberal and creative arts and sciences. UMass Dartmouth is a Tier 1 national research university that offers a private college educational experience and public university value. The University serves as an intellectual, economic, and cultural catalyst in the region and the world. And the entire University of Massachusetts system has a world ranking on The Times of London’s prestigious “World University Rankings” list. A number of unique initiatives and facilities enhance your research and educational opportunities at UMass Dartmouth. At this time, the University is actively focused on interdisciplinary research activities for the Blue Economy, community resiliency, and homeland security. The School for Marine Science and Technology (SMAST) is located on the water in New Bedford, where scientists do groundbreaking work in areas such as estuary protection and fisheries science, utilizing the “living laboratories” of Buzzards Bay and the Atlantic Ocean. At the Center for Innovation and Entrepreneurship in Fall River’s South Coast Research and Technology Park, faculty and students partner with industry on innovative technology ventures. The Star Store Arts Campus offers spacious studios and cutting-edge facilities in historic downtown New Bedford, a city often cited as a thriving center for artists. The Kaput Center for Research and Innovation in STEM Education brings together scholars who are working to improve math comprehension and instructional approaches. The IDEA Studio on campus is a digital fabrication/multimedia space for advanced projects and collaborations across disciplines. The University of Massachusetts Dartmouth is also home to the only public law school in the Common-wealth of Massachusetts. UMass Law provides students with the intellectual and professional training needed to pursue justice in a variety of settings. Internships, practicums, and clinics provide extensive practical experience. Students can choose to study full-time day, part-time day, or evenings/weekends to earn the Juris Doctor degree. Graduate professors have impressive expertise and experience and are accomplished researchers who bring you real-world perspectives and international knowledge. Honggang Wang, Electrical and Computer Engineering, received multiple National Science Foundation grants for his work on wireless networks and multimedia applications and wearable body sensors for premature infants. Richard Connor, Biology, is a world-renowned researcher of dolphins and their “complex social relationships.” Dan Braha, Decision and Information Sciences, analyzes “complex networks” and their potential for combatting societal ills. Kristen Sethares, Nursing, does extensive research on cardiovascular health and recuperation. Robert Fisher, Physics, does cutting-edge research on computational astrophysics. Bryan McFarlane, Fine Arts, exhibits paintings around the world. John Buck, Electrical and Computer Engineering, is the recipient of the National Science Foundation’s CAREER Award and a prominent acoustics researcher. Kevin Stokesbury, SMAST/Fisheries Oceanography, is a noted authority on preservation of scallops and other species’ stocks. At UMass Dartmouth, you’ll grow academically, personally, and professionally. You’ll attend small classes, develop solid relationships with faculty members, use state-of-the-art laboratories, and engage with a variety of UMass Dartmouth research centers and institutes. The University’s extensive library collection, art studios,and business, engineering, and science incubator facilities provide excellent resources for your advanced study, research, and creative work. UMass Dartmouth supports your personal and academic success. Academic resources include the International Study and Travel Office and the Career Resource Center. Resources such as the Counseling and Student Development Center, Frederick Douglass Unity House, Religious Resource Center, Women’s Resource Center, and the Fitness Center help you maintain a sense of well-being, achieve personal growth, and celebrate diversity. There are numerous social and intellectual opportunities, from lectures to cultural celebrations, intramurals, intercollegiate athletics, and community service opportunities. You can take advantage of an array of visual, performing, and literary arts events. Located in the scenic coastal community of Dartmouth, Massachusetts, the University is situated on 710 acres, with easy access to Boston, Fall River, New Bedford, Cape Cod, and Providence, Rhode Island. Nearby shopping, entertainment, restaurants, museums, and theaters make this a vibrant hub. Recreational sites are minutes away, including beaches and hiking. You can drive to New York City in four hours, and the mountains of New Hampshire and Vermont are three to four hours away. Public transportation is available from campus to nearby communities. The dramatic campus is the work of architect Paul Rudolph, former Dean of the Yale University School of Art and Architecture. The library is a state-of-the-art, energy-efficient space that serves as both the intellectual and social heart of campus. A campus-wide, $175 million building and renovation program is underway to upgrade and improve academic facilities. UMass Dartmouth has a residential complex on campus specifically designed for graduate students. You may apply for residential housing, and the University also provides resources that help you obtain suitable off-campus housing. Costs vary by program. For academic year 2018–2019, annual tuition and fees totaled approximately $12,252 in state, $21,855 out of state, and $15,526 regional and proximity (based on nine credits per semester). UMass Dartmouth offers several financial programs to help fund your education. You may qualify for teaching, research, or administrative assistantships; federal loans; University scholarships; and federal work-study funds. You may also obtain non-need-based employment on campus or seek off-campus employment. In addition, if you’re a doctoral student, you may receive merit-based fellowships that include annual stipends and full-tuition waivers.